It may seem like a small part of a vast language, but Spanish greetings could well be one of the most important parts of your Spanish speaking skill. Given that the majority of us are going to be visiting Spanish speaking countries, or intermittently seeing people, we really should have our Spanish greetings up to par. In our own language there’s never any problem and we instinctively know, from years of practice, how to greet someone correctly, how to send our regards to another and how to say goodbye in the right way. In another language, of course, things just aren’t as simple. To get it right, as we are discovering, we cannot simply translate what we say in our own language into Spanish. Saying goodbye also has its challenges. The point is with these Spanish greetings and farewells that unless you know them, there’s no way you can get them right. The same applies to the act of sending your regards. There’s a very specific way of doing so and not only that, but when someone sends their regards, there’s a very specific way that you should reply. What are they? Well, the way to find out is to watch or listen to the podcast and listen to how we use these important Spanish greetings in conversation which is often the best way to learn them. After all, that’s how we learnt our own language. All of our podcasts are backed up with a full and clear helpsheet that is designed to help you get the maximum learning from this lesson. 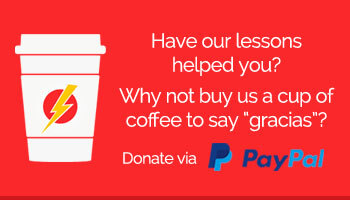 Although all of the lessons are free and can be downloaded to listen to over and over again, we do ask a small amount for our helpsheets which go toward funding our future lessons to help you take your Spanish to LightSpeed. Gracias a todos por vuestra atención. Suerte con vuestros estudios. The Verb Haber in Spanish. This verb is probably one of the most important verbs in the Spanish language! Why? Because, it has a specific job to do in just about every tense that exists in Spanish. Firstly, you will have seen this verb mentioned in all of your textbooks in which they call it the “auxiliary verb”. This simply means that this verb is a “helper” verb. It works with other verbs to create sentences like, “I have eaten today”. The word, “HAVE” is the auxiliary part, which is from HABER in Spanish, and “EATEN” is the past participle of the verb TO EAT. As you will see in the podcast, we explain that Haber in Spanish appears in multiple types of conversation. The very famous word “HAY” comes directly from the verb HABER. This word means “there is/there are” and you probably would agree that it is something that we use in most conversation. HAY is a strange word because it can relate to one thing or to multiple things and yet it’s structure doesn’t change. For example, one of the confusions that many students have is when they use this word in the past. For example, when they want to say, “There was” they use, “HABÍA”. However, the confusion sets in when they want to say “There were”. The temptation is to say, “HABÍAN”. However, this isn’t correct because, just as the word, “HAY” refers to one or multiple things, the same applies to this word when it is in the past. Therefore “HABÍA” means “there was/there were”. If you think that the names that are given to the normal tenses are difficult to understand or remember, then when we get to the verb HABER in Spanish, we realise that the linguists had just been warming up. Some of the names that have been given to what are known as, “the perfect tenses”, border on the incredulous. For example, if you wanted to say, “I had spoken to him.”, which in Spanish is, “Yo habia hablado con él.”, you have to use the “Pluscuamperfecto de indicativo”. How about that for a mouthful. Far better to have called it the “Had Eaten” tense, ¿verdad? I would have eaten it if I had been hungry. = Me lo habría comido si hubiera tenido hambre. How can I remember these names? Our advice is that you don’t sweat the names. After all, you use all of these tenses in your own mother tongue without ever having to know the names. The same applies in Spanish! Enjoy the podcast. We hope that it is of value to you in your learning journey. Remember that all of our podcasts are backed up by in depth helpsheets that explain everything for you and test your understanding. Here is a link to a blog that breaks down Haber in every way possible. Thanks Suzie! Click Here.